By the 1940s, Lincoln Works covered over seven acres, and was the country's largest factory producing electrical accessories. 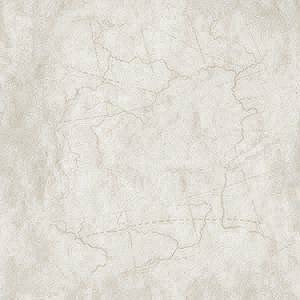 The company was also one of the country's largest consumers of porcelain for electrical purposes. By 1946 the company employed around 1,800 people, who were carefully selected for intelligence and initiative. 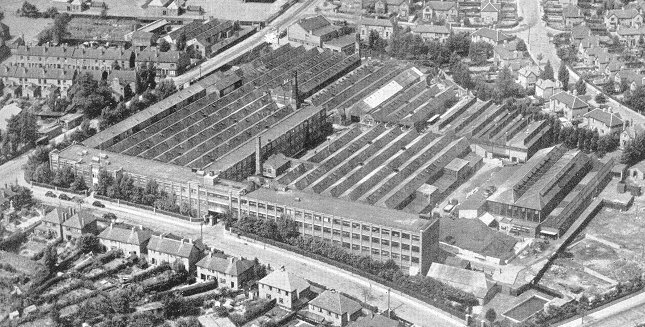 The firm had its own research laboratories, and manufactured all of the component parts for the Crabtree products, except the porcelain, which came from the potteries at Stoke-on-Trent.. 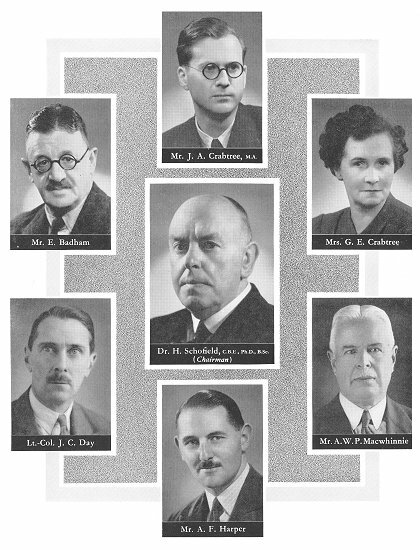 The company's directors in 1947. A map of the area today, showing the site of Lincoln Works. 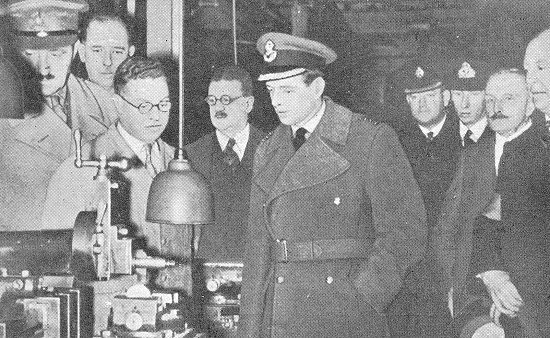 The Duke of Kent at the factory in December 1940. The entrance to the offices. 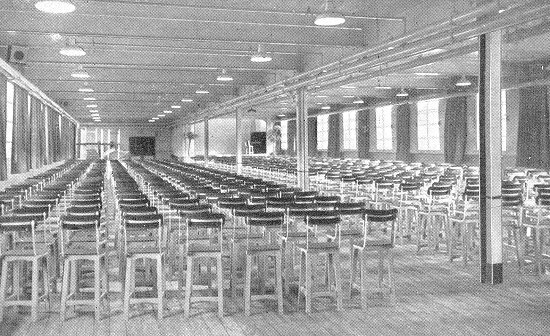 The canteen, laid-out for an evening concert. All the raw materials purchased by the company were tested and examined before use in the factory. Samples were taken for chemical analysis, microscopic examination, and physical testing. During the manufacturing process, further tests were carried out to ensure that all components would perform correctly in use. Pressed items were examined for uniformity of hardness and thickness, and if annealing was necessary, the most suitable temperature for the annealing ovens would be chosen. Tests were carried out on every metal part that had to be heat-treated, to make sure that no deterioration took place. Microscopic examination of grain structures. A close eye was kept on the raw materials that went into the cupola furnaces in the foundry, to make sure that cast iron was produced to the correct specification, and to determine the optimum casting temperature. The laboratories also ensured that the paint and enamels used in the factory were of the highest quality. Tests were carried out on their resistance to corrosion and abrasion, and also to the organic acids that are present in certain foodstuffs, which could damage the finish of cooker control units. The iron cases that were used on some of the switchgear cases were tested for their resistance to corrosion in an open area on the roof, where they were exposed to the elements for periods of time. Testing metal specimens for hardness. 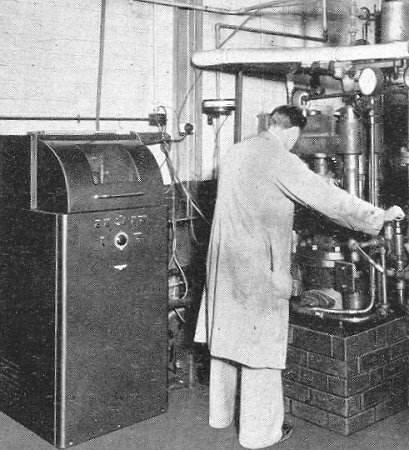 The laboratory had electrical plant to produce AC and DC voltages for a wide range of tests. The AC supply came from the mains supply, which was also used for a motor-generator set that provided the DC supply. There were also two banks of rechargeable batteries, each providing a 250 volt DC supply. The batteries were designed to withstand large short-circuit currents. The generating plant and switchboard. 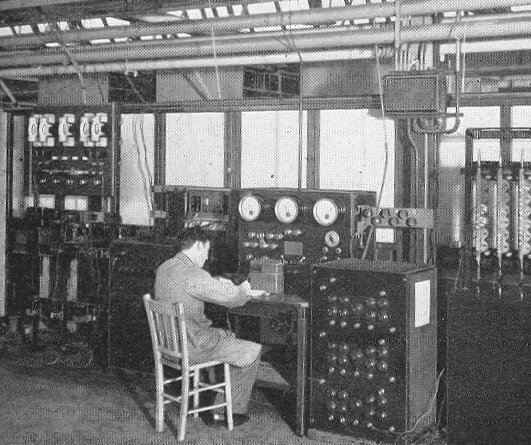 A corner of the electrical laboratory, showing some of the test equipment. Carrying out a humidity test. 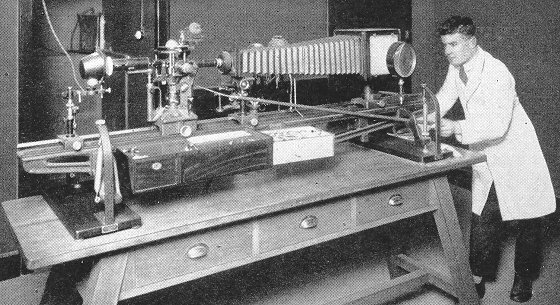 The laboratory had an extensive range of meters, oscillographs, and resistance bridges. All incoming materials were examined for their electrical characteristics to ensure that they were suitable for purpose. Finished products were also inspected and thoroughly tested to make sure that they operated within their specification. Overload characteristics were also tested. Efforts were continually made to improve existing products, both in the materials used, and construction. 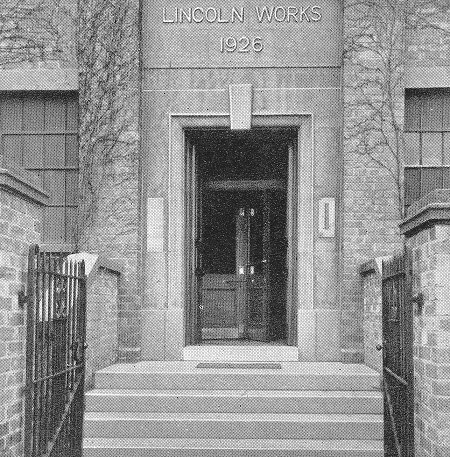 Lincoln Works' foundry used the latest and most up-to-date machinery including hydraulic and pneumatic moulding machines that were fed mechanically by hoppers. They were encircled by a slowly moving conveyor. The foundry, showing piles of pig iron. The production plant, and the conveyor, loaded with moulds. 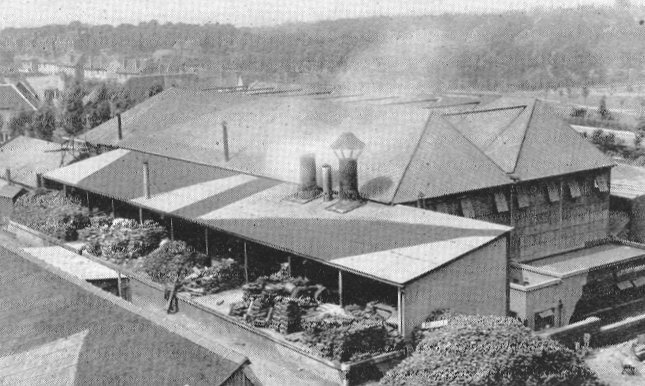 The foundry had siphon type cupolas that provided molten iron for most of each working day. The conveyor carried the moulds from the moulding machines to the pouring point, then on to the knock-out point, a journey of about fifteen minutes. At the knock-out point the casting was removed from the mould, which was then broken up. The sand fell through an open grid in the floor to an underground conveyor which carried it to an area where it was screened, cooled, and milled. Any remaining scrap iron was removed by a magnetic field. Flight conveyors then transported the refined sand to the hoppers for re-use. Pouring molten iron from one of the cupolas. 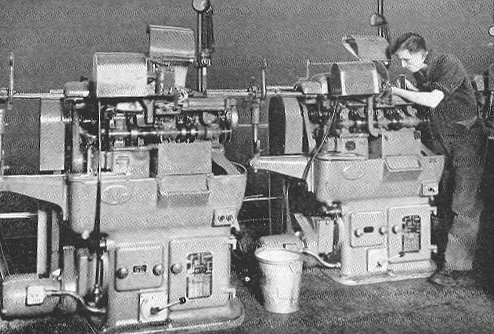 A moulding machine in operation. The castings were sand-blasted to remove any remaining sand, and to show-up any surface defects. They were then transported to the grinding and bobbing machines for cleaning-up, before going to the mechanical enamelling plant, to be given a heavy stove-enamelled finish. 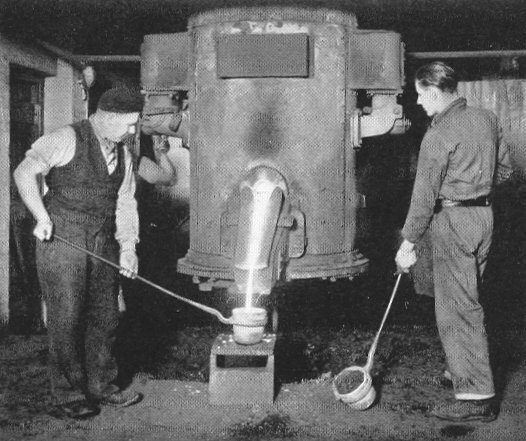 Some hand moulding was still employed for castings that were unsuitable for mechanical production. For this work, a few highly skilled moulders worked in the traditional way, carrying out floor and stump moulding. 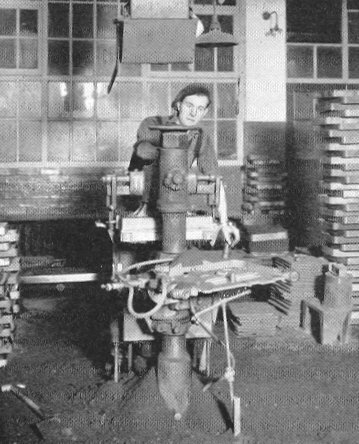 The company had its own patternmaking section where patterns were produced in wood, white metal, aluminium, and gunmetal. The cast-iron components were carefully monitored by a metallurgical chemist, who ensured that the highest standards of quality and accuracy were maintained. 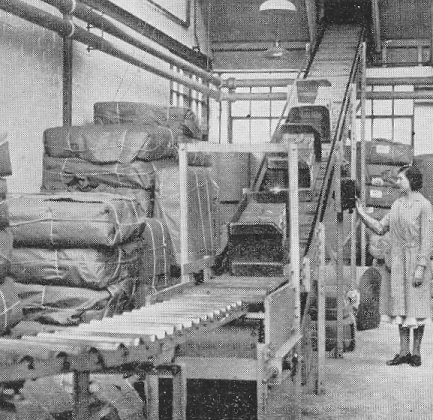 The moulded cases and covers used in Crabtree products were produced in the factory's moulding department, on hydraulically-operated presses. 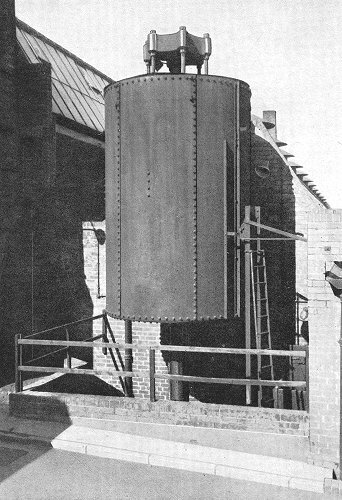 Hydraulic pressure was supplied by an eighty ton hydraulic ram, mounted high on the building. Components were moulded in 'Jacelite' (phenol formaldehyde), and P.V.C. The dies for the mouldings were produced in the toolroom to a very high standard. The quality of the finished product depended entirely on the quality of the die. The presses had steam-heated platens, which were maintained at a precise temperature. The high quality finish achieved relied upon the close cooperation of many members of staff, including the artist, the draughtsman, the research chemist, the toolmaker, and the plastics production engineer. At every stage of production, the process was carefully monitored. The eighty ton hydraulic ram. Some of the hydraulic presses. The steel dies for a switch socket outlet cover, together with some of the mouldings. The production process was automated as far as possible. 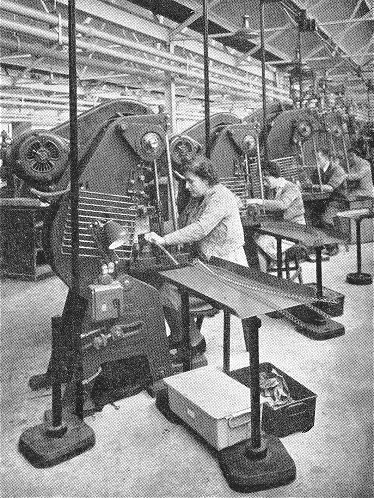 In the late 1940s the company always used machines made in the UK. 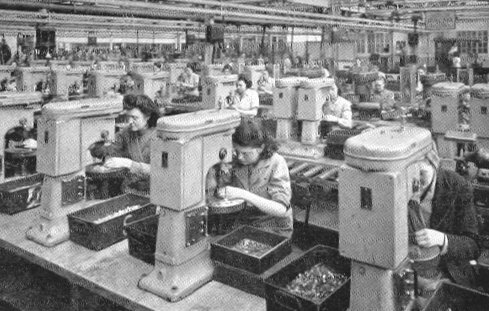 Millions of small component parts were produced each week for the wide range of Crabtree products. Many high speed machines were used, such as . drilling machines that ran at speeds from 5,000 to 10,000 revolutions per minute. 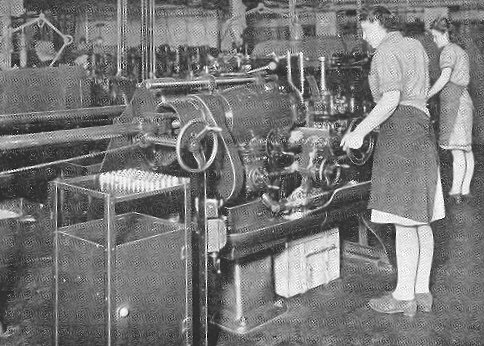 High speed machines were used in the automatic turning department where millions of small screws and terminals etc. were made. 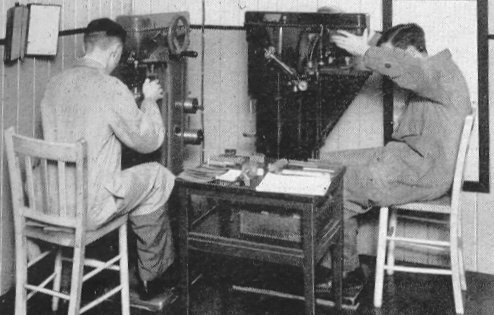 Some of the smaller components such as switch contacts went through a sequence of delicate bending operations which had to be carried out by hand, using the old-fashioned fly press. 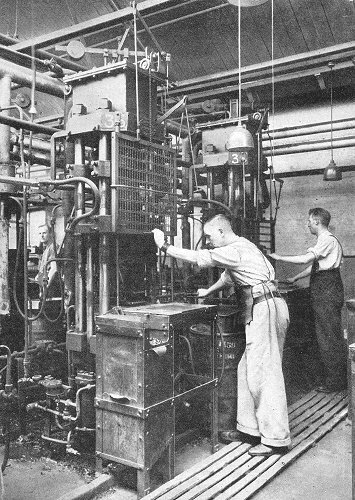 The firm's power presses were equipped with multiple tools and could produce between three to four hundred parts a minute. Stamping blanks from metal strip. A few of the large number of turned brass parts used in the company's products. Part of the power drilling bay. Machining components to close tolerances. Adjusting a high speed automatic machine. The company moved away from multiple cartons to separate cartons for each product, made of strong cardboard, printed in a distinctive red and black design. The individual cartons were placed in strong outer boxes made of corrugated cardboard, holding six or twelve of the cartons. This technique eliminated breakages during transit, and allowed the individual products to be easily identified. A corner of one of the packaging rooms. 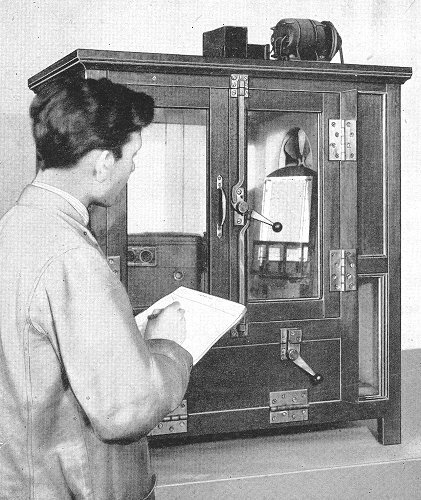 The company's ironclad switchgear, and the larger automatic control units were packed individually in corrugated cardboard cartons. The cartons were transferred from the stock bins and placed in conveyor trucks. After checking against the customer's order, they were placed on a roller-conveyor belt to be carried to the packing room, where they were placed in suitable boxes or cases. The completed cases were transferred from the packing room to one of the company's lorries or trucks for delivery. Part of an export order being loaded onto one of the company's lorries. 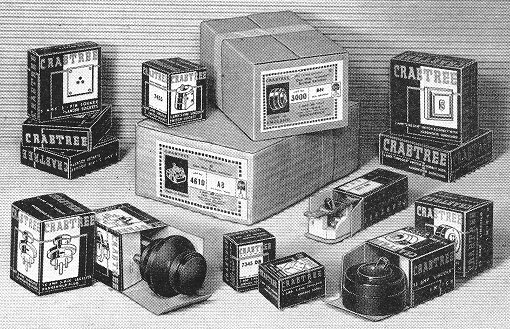 Crabtree products were sold throughout much of the world. The company had agencies in Argentina, Australia, Barbados, Belgium, Brazil, British Columbia, Burma, Ceylon, China, Columbia, Cyprus, Egypt, Ireland, Ethiopia, Faroes, Fiji, Finland, France, Gold Coast, Greece, Iceland, India, Iraq, Italy, Kenya, Malaya, Malta, Mauritius, Mexico, New Zealand, Norway, Palestine, Peru, Portugal, Seychelles, Siam, South Africa, Sudan, Sweden, Switzerland, Tanganyika, Trinidad, Turkey, Uruguay, and Zanzibar. There were also distributors in Afghanistan, Algeria, Chile, Costa Rica, Denmark, Hong Kong, Indonesia, Libya, Madeira, Morocco, Tangier, and Uganda.